Being overweight increases the risk of damage to your heart and arteries. High blood pressure increases your risk for a heart attack. High cholesterol increases your risk of a heart attack. Diabetes damages your blood vessels when your blood sugar levels are out of control. 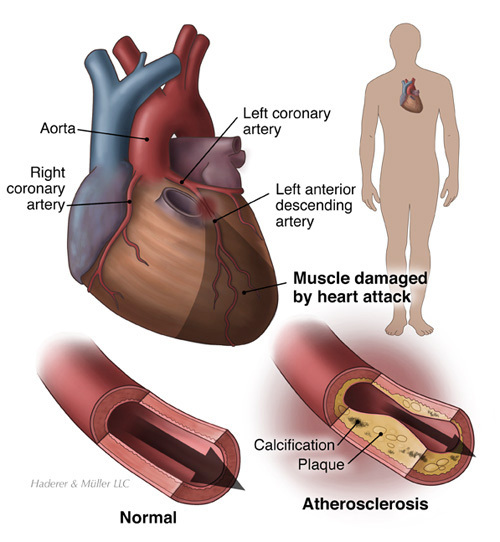 Smoking narrows your blood vessels; it increases your risk of dying from heart disease. Men have a higher risk of heart disease after age 45. Women have a higher risk of heart disease after age 55. African Americans and Hispanics have a greater risk for high blood pressure and heart disease. Illegal drug use, such as cocaine or methamphetamine, increases your risk of heart attack.